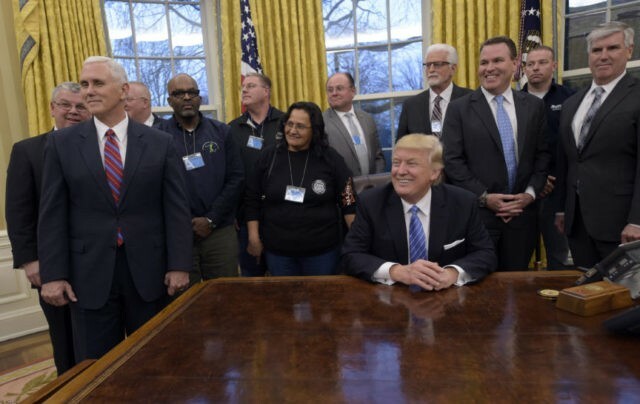 Union leaders and progressives are increasingly worried that President Donald Trump will bring a large number of private-sector union members — and some union leaders — into his populist Republican Party, according to the New York Times. Some unions, even if traditionally Democratic, have aims that align with Mr. Trump’s stated priorities: building infrastructure, rewriting trade agreements, blocking an exodus of jobs. But union leaders are in many cases scrambling to get in step with members who responded to his pro-worker rhetoric — and to tap into that energy. Progressives have groused that some blue-collar unions are willing to sell their souls for a few thousand jobs. They say that members who enthuse about the president’s ostensible victories for workers, like his efforts to block the manufacturer Carrier from sending jobs to Mexico from Indiana, are utterly blinkered. “Trickle-down economics dressed in populist garb is still trickle-down economics,” wrote Robert B. Reich, labor secretary under President Bill Clinton. In November, Trump won large slices of support from the unions; membership, especially among the skilled workers in the industries that stand to gain from Trump’s “Buy American, Hire American platform. For example, a union leader with the Communications Workers of America estimated Trump won votes from a third of the union’s members. That’s great for Trump’s ballot-box score, but it also causes heartburn for the GOP’s Chamber of Commerce wing, which is pushing hard for “right to work” laws that reduce the union’s clout and are still pushing for open-trade rules with low-wage foreign producers.